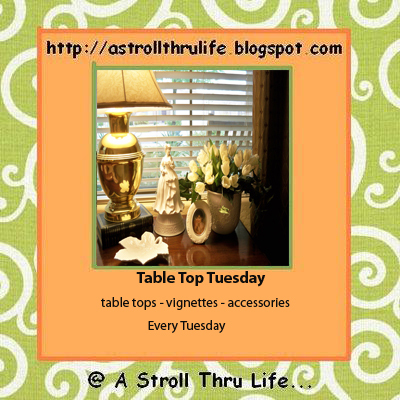 Welcome to the 112th Table Top Tuesday. I am so thrilled you have joined. Life has been a little busy around here and I apologize for not visiting as much as I would like. My son has a new house and I have been super busy helping him get ready to move. While he was working last week, I spent a couple of days cleaning and setting his kitchen and bathrooms up. The big furniture move comes this next weekend. Nice to have some of the basics done, and I always feel like half the job is done when the kitchen is usable. I will be showing you pics as he gets moved and things start to get decorated. I am playing musical furniture with him and my daughter, so I have a new piece to show you later. Now let's see some of the fabulous links from last week. There were so many it is always so hard to choose, I hope you were able to visit most of them, you would have found tons of inspiration. Decorating Tennis Girl shows us how she is fluffing and redoing her patio and garden. Can't you just imagine sitting here and enjoying the warm weather. All is Amazing is a brand new blogger that you really need to go and meet. You will love this wonderful table centerpiece that she has created. Something Nice and Pretty put up these wonderful shelves and don't you absolutely love her displays. How fun these are going to be to change and rearrange with all kinds of vignettes. Mrs. Hines Class is also a newer blogger that you need to meet. You will love her style, just look at this great vignette she created on her buffet. Love the chalkboard. 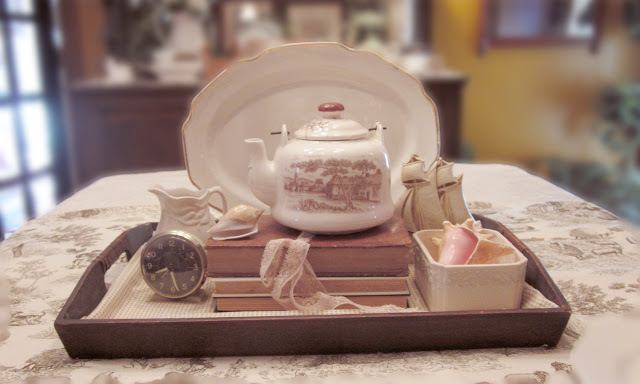 Elegant Economies give a tutorial showing how she created this wonderful vignette. Great tutorial to use for any display. Copper-n-Things shows this wonderful thrift store ottoman that she uses as a coffee table. Love her vignette and look at the rooster. Way too cute. Now let's see what all you have been up to this past week. Also, thank you so much for stopping by and linking up, I love seeing all of your vignettes. Thank you Marty for all the fabulous ideas and beautiful photos. Wonderful features this week Marty! Thanks for introducing us to new friends. And thanks also for featuring Robin's charming patio. Robin and I are both only children and have become "sisters" to one another. Blogging is such a wonderful way to bring friends together ~ friends like you!! Thanks Marty for hosting your wonderful party again! I never miss it! Thanks for hosting, Marty and great features. I will have to visit the new ones. Wonderful photos, Marty! A new house for your son; how exciting! I've been super busy too getting ready for a family reunion. My sons are all going to be home this weekend. Can't wait to see them! They haven't been together for five years. Thanks for hosting and have a lovely week. Wonderful features from last week. I'm happy to be joining you this week to commemorate the 100th anniversary of the Titanic. Thank you for hosting our party. It's such a busy time for you! Your fammily is so lucky to have you to help. Moving is such a nightmare! Thanks so much for taking the time to host once again, Marty! Great features, and thanks for hosting. Enjoy this wonderful time with your son. I understand, Marty. It is hard to visit so many, and there are so many talented bloggers out there. I feel badly for the people who link up and get few visitors, it is discouraging to them. Of course, you have to visit if you want people to visit you. I think some people link up, but don't visit. I try to visit as many as I can. Thank you so much for featuring my Spring Tabletop :) This week I linked up my message centre make over. Thanks for hosting! thanks for hosting Marty! We totally understand life gets in our way of blogging:) That has been me lately too! So much great inspiration! Thank you for hosting! Thanks so much for hosting your linky party. I also love all your features so much inspiration, hope you have a wonderful week with your family. Lovely features this week, Marty! Nice features, Marty! Thanks for hosting. Good luck with helping your son move. Nice features Marty, I specially like the new blogger's centerpiece. Thank you lovely lady for hosting your fabulous party and for having me once more. Happy TTT! Enjoy your week. Yea for your son's new house! I agree about getting the kitchen done....really makes you feel accomplished. I really look forward to seeing the pictures of his home. I've been tempted to play musical furniture with family...but haven't yet. THANK YOU for the feature and shout out! I am very appreciative. Thanks so much for hosting. Great features. Hope you will be sharing photos of your son's new home. I love how you showcase some of last weeks links! I am looking forward to seeing what you've doing at your son's home too. Sounds like fun and exciting too! Hello Marty, wonderful features this week, love meeting new bloggers. Wonderful features; I love them all! My link up disappeared from the site. It was to be #45...don't know what happened! However, I'm loving all the other links today! All so pretty ! Everyone has so many different and lovely ideas ! Thanks for sharing . Have a good day ! Great features from last week...looking forward to your new porch items!...Thanks for hosting!! Wonderful features Marty. Thank you for hosting and have a great week. Awesome that you featured your reader's posts every now and then. That's a good idea, so your readers got some credits for their work. Very good indeed. Happy TTT to you and to your participants. Always a good job. Beautiful features! Thank you for hosting, Marty! Lovely variety in the features, Marty! Thanks for hosting! I didn't think I would have a post for this week, however, I had a brainstorm this morning. Although I am late to the party I have linked a tabletop story that is a tad out of the ordinary. Hope that's okay. I love your features, Marty! It's fun to check out some new blogs. I also loved your ottoman tutorial. Thanks for that and for hosting! Oh my gosh... loved the double shelves. I have nowhere to add that kind of thing, but I sure wish I did... and the black ottoman and rooster......what a clever photo. Your features are so fabulous. I am not a rooster girl, but I have to admit he is wonderful. Thanks for hosting! Thank you, thank you, thank you for featuring my post, Marty! You encouraged me just when I was needing it the most! You are soo KIND♥ Your breakfast table is lovely....as are ALL of your settings! Nice featured posts. Sons are a great help and some husbands are handy.